Blog Cuirm-chiùil ùr! / Ceolchoirm nua! / New gig alert! As you might remember, we sadly had to postpone a few gigs last month due to the ‘Beast from the East’! 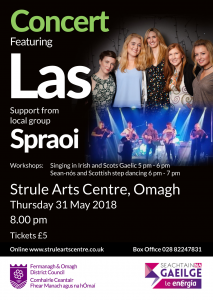 We’ve been quietly working away in the background trying to reschedule these and we’re excited excited to announce that we’ll be performing at the Strule Arts Centre, Omagh on Thursday 31st May. Tickets are a bargain £5 and you can book them online at www.struleartscentre.co.uk. 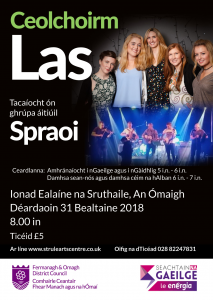 Tá súil againn go bhfeicfidh tú ann / Tha sinn an dòchas ur faicinn ann / We hope to see you there!